This month has been filled with so much pride and recognition for people of color, especially women of color (#WakandaForever)! As a black woman in business raising African American children, I admire the strength, grace and humility black women display as we face the challenges of our society — formerly and presently. As we wrap up Black History Month, I want to take some time to highlight and celebrate a noteworthy woman in Black history and easily one of my favorites: former First Lady of these United States, Michelle Obama. It has been said that “behind every strong man is a strong(er) woman.” In the Obama household, this certainly appears to be the case (I’m sure President Obama would agree). As an acclaimed attorney, business woman, humanitarian and mother, she has been a woman of exemplary standards serving as an example and inspiration for women in America, particularly ones of color. She contributes to the notion that success is multi-faceted. Mrs. Obama’s style and grace has warmed the hearts of many Americans over the years. While we marvel in her beauty and grace, we sometimes forget that Michelle Obama is a Princeton and Harvard Law graduate. Let’s just pause and say that few people of color can espouse such credentials. After working for Sidney and Austin Law Firm in Chicago (where she met Mr. Obama) she went on to grow her resume holding high-ranking positions throughout the City of Chicago. She was the first Associate Dean at the University of Chicago, Vice President of Community and External Affairs at the University of Chicago Med Center and Founding Executive Director of the Chicago Chapter of Public Allies, an Americorps program which encourages youth to engage in public service. What I love most about Michelle Obama was her willingness to set her career aside to serve as First Lady of our country. What few people realize is that Michelle Obama was the highest income contributor between she and Barack prior to his political career taking off. For African-American couples, this can be a tough ground to maneuver. Yet, she managed through it set this career aside to pursue her husband’s passion. And it paid off big time!! As First Lady, Michelle Obama leveraged her platform to focus on her community passions: combating issues from obesity to educating our youth, issues that impact all children but especially children of color. You see… she exemplified #BlackGirlMagic long before the hashtag existed! My favorite is the The Let’s Move! Program, targeted childhood obesity in our communities by rallying community leaders, educators and medical professionals. Let’s Move! encouraged healthier food choices and more physical activity in schools and an overall healthier food market for youth in America. The School Lunch program required school districts across the country to serve more fruit, vegetables, whole grains, lean protein and low-fat dairy products and provided free and reduced-price meals to more than 21 million low-income children. 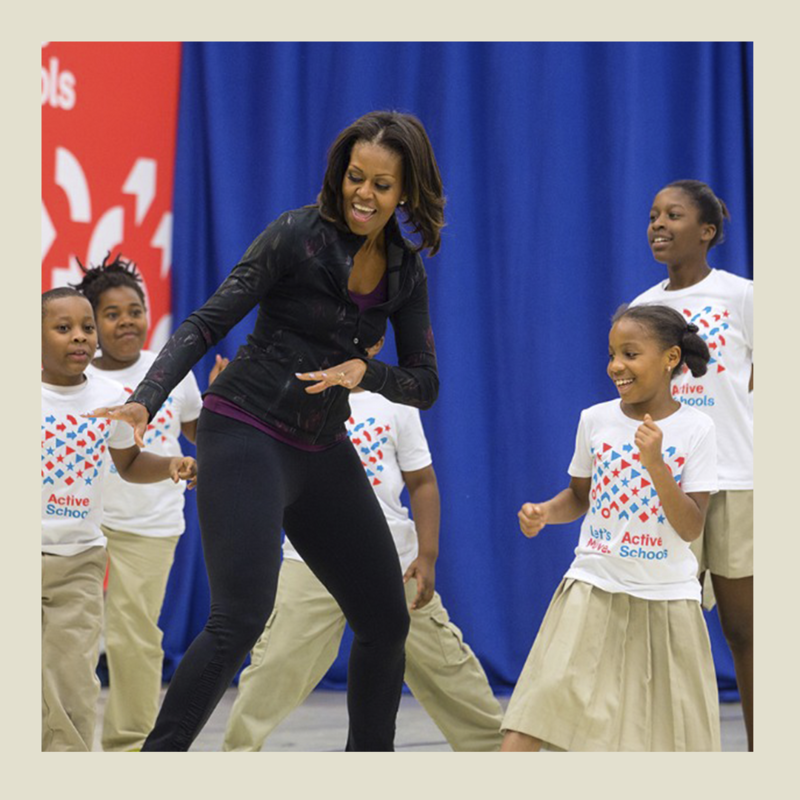 It was impactful in part because Michelle Obama made it cool to watch: I mean…how many First Ladies have you seen do The Dougie on national T.V. or appear on a Doc McStuffins episode to deliver her message? Her Let’s Move! initiative got a lot of kids in the nation going in a healthier direction. I also loved the Let Girls Learn campaign that strived to educate girls all over the world by helping them start school and, more importantly; GRADUATE. Uncle Funky’s Daughter participated in a social media campaign Michelle Obama launched which shared startling statistics about the gap in education for girls around the world. We each have a part to play in ensuring children — especially our young girls — are given equal opportunities and access to education. That is one reason why we allocate funds from all sales to benefit women and children. These are just two of the several programs she launched as First Lady. I could go on, but I have to mention that she not only was brilliant, but she reset the image on what a First Lady should look like. I am not talking simply of the color of her skin. Michelle Obama showed the world that the First Lady doesn’t need to wear a St. John suit. She introduced the world to J. Crew and sleeveless dresses that showed off those guns we know as her arms (the arms that all women over 40 want!). She was a true fashion icon, and the first since Jackie O. Creating history “in the now” is not an easy task, especially when you’re under serious scrutiny. Michelle Obama has done so gracefully, humbly and effectively. She has been such an inspiration to those around her, the nation and the world, and I’m proud to call her my favorite woman in black history. Next → Next post: What Is Hair Porosity and Why’s Everyone Asking About It?